SACRAMENTO, CA — The California Chamber of Commerce today added three more bills to its job killer list, bringing the total number of job killers to 27. AB 2384 (Arambula; D-Kingsburg). The bill would mandate that medication-assisted treatment for substance abuse disorders be covered by health insurance. 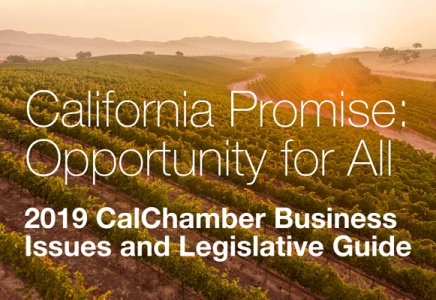 CalChamber has tagged this bill as a job killer because it eliminates all quality control and cost containment mechanisms for treating substance abuse disorders, which would significantly increase the cost of health care. This mandate will fall solely on individuals, and small and medium employers because most large employers are self-insured and not subject to this mandate. It will also encourage employers that can move to self-insurance to do so as a way to avoid the mandate. The shift to self-insured employers away from insured employers leaves a smaller pool of employers over which to spread the costs of these mandates. Finally increasing premiums will drive healthy risk out of the market, leaving fewer to pay for this mandate. AB 2384 is scheduled to be heard in the Assembly Health Committee on April 24. AB 2613 (Reyes; D-Grand Terrace). The bill would change the California Labor Code and make an employer or other person acting individually or as an officer, agent, or employee of another person who fails to pay or causes a failure to pay specified wages of each employee subject to a penalty of $200, payable to each affected employee, per pay period where the wages due are not paid on time. CalChamber has identified this as a job killer because it would impose another layer of Labor Code penalties for wage and hour violations in addition to the penalties already available under the Private Attorneys General Act (PAGA) and imposes personal liability onto employees who have no control over the actual payment of wages. These provisions will significantly increase litigation against California employers and limit their ability to invest in their workforce. AB 2613 passed the Assembly Labor and Employment Committee on April 18. The bill now moves to the Assembly Appropriations Committee; no hearing date set. SB 1121 (Dodd; D-Napa). The bill would authorize a consumer whose personal information has been or is reasonably believed to have been breached to institute a civil action for specified remedies, including damages not less than specified amounts, injunctive and declaratory relief, or any other remedy the court deems proper. CalChamber has identified SB 1121 as a job killer because it would remove the requirement of economic injury for standing to bring a claim in California against a company for a data breach, undermining the intent of voters, and drastically increasing liability for companies without providing any corresponding benefit to California consumers. Passing SB 1121 would drastically expand the civil liability of companies providing goods and services in California without any corresponding benefit to California consumers. SB 1121 is scheduled to be heard in Senate Judiciary on April 24. To view the job killer list, visit www.cajobkillers.com.